Human과 Mouse, Rat에서 공통으로 사용 가능한 AccuTarget™ Negative control siRNA는 non-targeting siRNA로써, Human과 Mouse, Rat의 알려진 모든 유전자들에 대해 homology가 낮은 sequence를 포함하는 siRNA입니다. 따라서 모든 유전자의 knockdown실험에 negative control로 사용할 수 있어서 편리합니다. 또한, Transfection 효율을 쉽게 관찰하기 위하여 Bioneer는 siRNA uptake를 확인할 수 있는 Fluorescent labeled Negative control siRNA 를 제공합니다. AccuTarget ™ PC siRNA (Human GAPDH, GFP, Luciferase) : 고효율의 타겟 유전자 KD 효과를 검증하였습니다. AccuTarget ™ NC siRNA (Human, Mouse, Rat 공용) : 타겟 유전자와 homology가 낮은 서열의 제품입니다. Fluorescently labeled siRNA에 의해 간단하게 siRNA delivery 모니터링 할 수 있습니다. AccuTarget ™ Control siRNA Sets (PC+ NC) : 간편하고 저렴한 control set를 함께 구매할 수 있습니다. 다양한 scale (5, 10, 20 nmole) 및 purification (BioRP, HPLC) 선택할 수 있습니다. 90% 이상의 knockdown 효율을 갖는 positive control siRNA 입니다. 형광물질로 labeling되어 편리하게 Transfection Rate에 대해 효능 검증이 가능한 negative control sets 입니다. 연구비용 대비 극대화된 효율을 확인할 수 있습니다. Figure 1. Effects of Human GAPDH Positive Control siRNA. 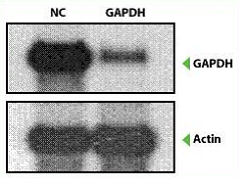 HeLa cells were transfected separately with AccuTarget ™ Human GAPDH Positive Control and Negative Control siRNA using Lipofectamine 2000 (Invitrogen) at a final concentration of 100 nM. 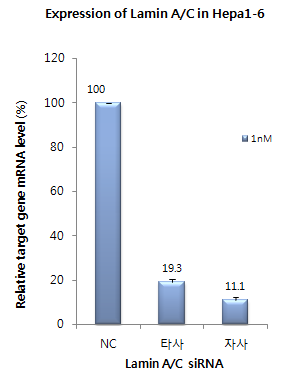 Total cellular RNA was isolated from transfected cells 24 hours after transfection and subjected to northern blot and real-time PCR analysis. 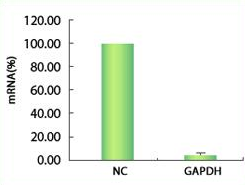 As can be seen from Fig.1-B, about 3% GAPDH mRNA remained. Figure 2. HeLa cells in a 24-well plate were cotransfected with 200 ng of CMV-GFP plasmid and 10 nM of GFP siRNA using Lipofectamine 2000 transfection reagent. Next day, the expression of GFP was observed by using a Nikon Eclipse TS100 epifluorescence microscope. 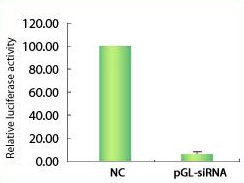 In contrast to bright green fluorescence of GFP protein in NC-siRNA-transfected cells, no fluorescence was detected from GFP-siRNA-transfected cells, indicating efficient knockdown of GFP by using our positive control GFP-siRNA. Figure 3. HeLa cells in a 6-well plate were cotransfected with 400 ng of CMV-luc plasmid and 10 nM of luciferase siRNA using lipofectamine 2000 transfection reagent. Next day, cells were harvested and assayed for luciferase activity. As shown in Fig. 3, cotransfection with our positive control luciferase siRNA led to efficient knockdown of luciferase activity (85% - 95% knockdown compared to luciferase activity of NC-siRNA-transfected cells). Figure 4. Effects of Mouse Lamin A/C Positive Control siRNA. Hepa1-6 cells were transfected separately with AccuTarget ™ Mouse Lamin A/C Positive Control and Negative Control siRNA using Lipofectamine RNAimax (Invitrogen) at a final concentration of 1 nM. Total cellular RNA was isolated from transfected cells 24 hours after transfection and subjected to real-time PCR analysis. Figure 5. 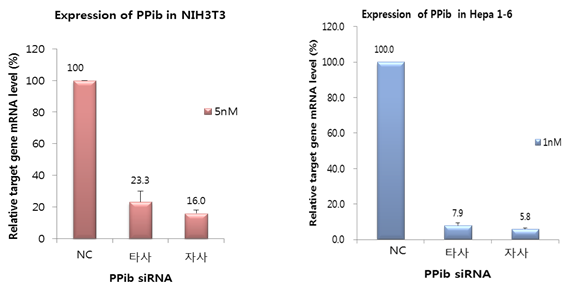 Effects of Mouse Ppib (Cyclophilin B) Positive Control siRNA. Hepa1-6 & NIH 3T3 cells were transfected separately with AccuTarget ™ Mouse Ppib (Cyclophilin B) Positive Control and Negative Control siRNA using Lipofectamine RNAimax (Invitrogen) at a final concentration of 5 & 1 nM. Total cellular RNA was isolated from transfected cells 24 hours after transfection and subjected to real-time PCR analysis.